My friend, Jill, gave me this fun hat and mug; and the saying on it is perfect. What if I did "think happy stuff" more? Attitudes would change and days would be brighter. So much to be said about ways of thinking. Love what my neighbor, Sarah, said about our thoughts and love. One part that stood out to me was about making a choice in our way of thinking, to overlook the negative and appreciate the positive. 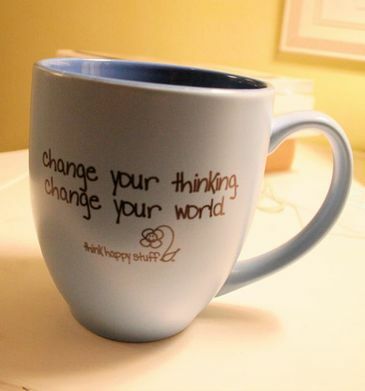 There is a great site ( where this hat and mug are from) that talks about simply thinking happy stuff and how when we change our thinking, we change our world. Love the idea..so creative... simple and true! 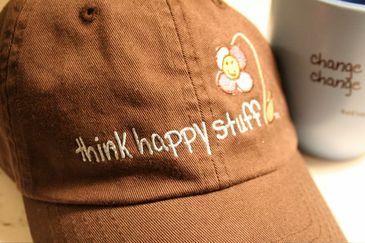 So my motto: if I start to worry: think happy stuff. If I start to see the negative: think happy stuff. Thank you Jilly Bean for these fun gifts and sharing this great way of looking at life. Rise and shine to happy thinking! !